India is the second largest producer of Vegetables in the world. 2.8% of the total cropped area of the country is under Vegetable production. To liberate agriculture from the clutches of climate change and to utilise biotechnology, farmers have adopted the use of high-yielding Hybrid seeds from well known companies. Farmguru brings the best of these seeds to the market with the convenience of ordering from the mobile phone and getting delivery at their doorstep. 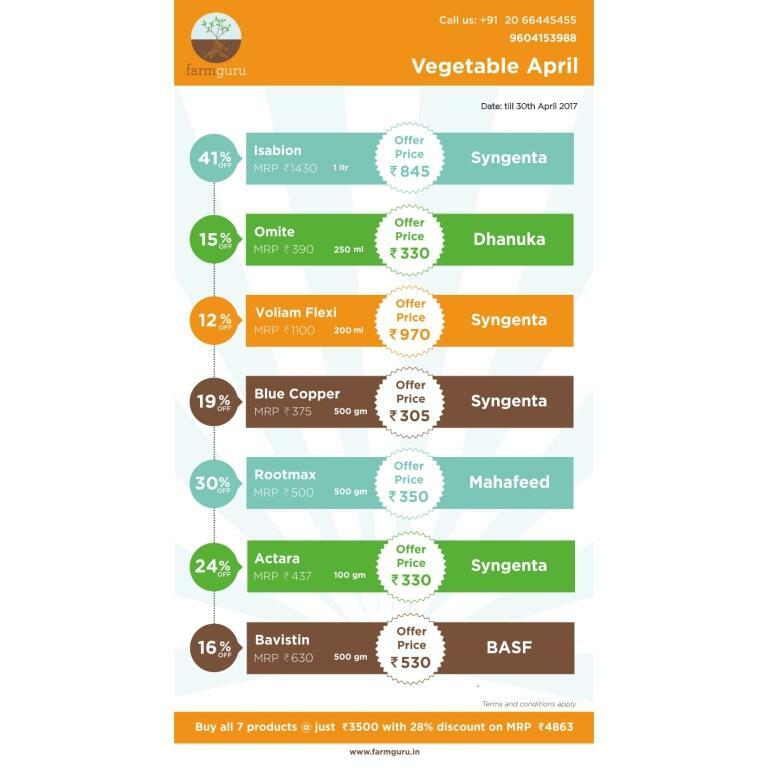 Farmguru uses its expertise to put together a list of the best products for vegetable growers. Get upto 37% bumper discount on MRP when you pledge an order with Farmguru ! Due to increase in demand and consumer awareness, organic products are priced anywhere between 20% and 75 % higher than the conventional ones. The Indian market for organic products is expected to cross the ?10,000 crore mark by 2020 and is rapidly growing at 40-50 per cent! The global demand for organic products is growing at 20-25 per cent per annum. Farmguru has certified organic products for use at your farm. The range includes Bio Pesticides, Bio Fungicides, Plant Probiotics, Bio stimulants etc. We are continuously adding new products to store.farmguru.in to make available the latest and rigourously tested farm inputs to our valued customers. New Farmguru Special Vegatable Monsoon Campaign has a basket of 6 essential Crop Protection and Nutrtion products for your current crop. New campaign products include Bavistin, a broad spectrum systemic fungicide; Amistar Top,a broad spectrum fungicide which controls Downy Mildew & Powdery Mildew. Insecticides Taffin & Profex Super controls many sucking and chewing pests, providing fast knockdown and long-lasting control. Isabion our very popular PGR make the latest basket offering from Farmguru a must-buy! The biggest concern for all grape farmers is the infection of young grape clusters. The most effective means of disease control in grape vines is preventative fungicides and insecticides treatment. Fungal diseases like Powdery Mildew, Downy Mildew and Black Rot, when left untreated, can destroy an entire grape crop. Taking into account the current crop stage and changing weather conditions, Farmguru has brought together the best of Integrated Pest Management products which have both contact and systemic activity to provide complete plant protection. Order from us and experience the Farmguru advantage ! Over 55 per cent of the net sown area in India lacks irrigation facilities and hence, farmers rely wholly on rain water for crop growth. To liberate agriculture from the clutches of climate change and to utilise biotechnology, farmers have adopted the use of high-yielding Hybrid seeds from well known companies. Farmguru brings the best of these seeds to the market with the convenience of ordering from the mobile phone and getting delivery at their doorsteps. Get upto 46% bumper discount on MRP when you buy seeds from Farmguru ! Thanks to all our participating farmers in making the Diwali Dhamaka Campaign a huge success! FarmGuru is back with Online Plus Campaign with Broad-Spectrum, Crop Protection products which promote plant growth, kill unwanted weeds and control various pests & diseases. This Basket of 6 hand-picked products is carefully curated for changing weather conditions and monsoon delays. Make use of this exclusive opportunity to improve your farm productivity! The biggest concern for all grape farmers is the infection of young grape clusters. The most effective means of disease control in grape vines is preventative fungicides and insecticides treatment. Fungal diseases like Powdery Mildew, Downy Mildew and Black Rot, when left untreated, can destroy an entire grape crop. Although it is much easier to correct and control damage caused by insects than that caused by fungal diseases; the most damaging insects are those that feed on fruit because the resulting rot can spread throughout the entire cluster. After recent success of FarmGuru Super Campaign, FarmGuru is back with broad-spectrum use campaign for disease and pest control in crops Shravan Campaign has brought a basket of 5 products suitable for current weather conditions. We deliver right products at the right time at the best prices and thus our registered farmers place orders repeatedly. Integrated Pest Management helps reduce the gap between actual and attainable crop yield. This monsoon campaign, FarmGuru has brought a basket of 5 crop protection products to protect and prevent attacks from pests and diseases. These top-selling products provide broad-spectrum disease control and promote plant growth, enabling farmers to maximize yield and profit. In India, Grape is cultivated over an area of 34,000 hectares with an annual production of 1,000,000 tonnes. Although Viticulture is highly remunerative, it is also capital intensive. The risk of losing a crop due to unprecedented changes in weather is also very high. FarmGuru has brought curated products for its Grape farmers for improving productivity and disease management. India contributes 12% of the total world production of Potatoes. Potato crop yields are determined by factors such as the crop breed, seed age and quality and crop management practices. Improvement in these can provide a major boost to farmer incomes. To increase the yield rate per hectare for Potato crop, farmers need timely usage of Agro chemicals. FarmGuru has selected the best products for its potato farmers to increase Crop yield and quality. India is the second largest producer of Vegetables in the world. 2.8% of the total cropped area of the country is under Vegetable production. The plant protection measures for the main pests and diseases of vegetables require careful monitoring. Get upto 31% bumper discount on MRP when you pledge an order with Farmguru ! Get upto 28% bumper discount on MRP when you pledge an order with Farmguru ! Over 90 per cent of the net sown area in India faces a severe Summer with temperatures exceeding 40 degrees Celcius. Farmers rely wholly on disease and temperature resistant varieties during this season for healthy crop growth. To liberate agriculture from the clutches of climate change and to improve yield by utilising biotechnology, farmers have adopted the use of high-yielding Hybrid seeds from well known companies. Farmguru brings the best of these seeds to the market with the convenience of ordering from the mobile phone and getting delivery at their doorsteps. Get upto 25% bumper discount on MRP when you pledge an order with Farmguru ! Tomato is one of the most important protective food crops of India. Area under tomato in the country is about 4.97 lakh hectares. The plant protection measures for the main pests and diseases of tomato require careful monitoring. Farmguru's 'Onion Group' campaign has brought a perfect mix of pest management for the Onion farmer. With excellent weedicides like Goal and Targa Super, time- tested Fungicides like Ridomil Gold and Antracol and a proven insecticide, Karate; getting a bumper harvest from your onion crop is certain. Humic Acid enhances nutrient uptake by the plant, improves the structure of soil and enhance the resilience of crop to cold, drought, pest, disease etc. Following on the success of the Grape Super Campaign, Farmguru has brought for you A-1 quality fungicides and insecticides, all with a proven track record to optimise yield and minimise crop losses. Proven products like Proclaim, which is a powerful product that controls lepidoptera and Revus, which assures more reliable foliar protection even in difficult climatic conditions are included in this unique basket for this campaign. Buy these 100%original products from Farmguru and experience excellent delivery service! A 1 campaign brings A-1 quality fungicides, insecticides and a Plant Growth Regulator as part of its basket offer for its farmers. Farmguru uses expert opinion to create an ideal product basket which provide overall protection for your crop. You can use the fungicides for the control of foliar blight, downy mildew, early and late blight, grey leaf spot and other diseases. Insecticides will give protection against biting and sucking pests, Jassids, Borers, Thrips etc. The PGR or Phytohormones promote the growth and development of plant cells and tissues. Make use of these inputs to increase your farm yield! Thanks to all our participating farmers in making the Independence Campaign a huge success! FarmGuru is back with Super Campaign with Broad-Spectrum, Crop Protection products which promote plant growth, kill unwanted weeds and control various pests & diseases. This Basket of 5 hand-picked products is carefully curated for changing weather conditions and monsoon delays. Make use of this exclusive opportunity to improve your farm productivity! India is the second largest producer of Onion in the world. farmers the list of Top Quality Crop Protection products! together can procure these at the best prices! Join the JULY Campaign now to get the maximum benefit! Get upto 48% bumper discount on MRP when you pledge an order with Farmguru ! The yield is higher than that of outdoor cultivation depending upon the type of greenhouse, type of crop, environmental control facilities. Year round production of vegetable, fruit and floricultural crops. Disease - free and genetically superior transplants can be produced continuously. Efficient utilisation of chemicals, pesticides to control pest and diseases. Water requirement of crops very limited and easy to control. India ranks second in fruits and vegetables production in the world. As per National Horticulture Board, during 2014-15 India produced 86.602 million metric tonnes of fruits and 169.478 million metric tonnes of vegetables. The area under cultivation of fruits stood at 6.110 million hectares while vegetables were cultivated at 9.542 million hectares. India ranks 1st in papaya production in the world and 2nd in cauliflower. The vast production base offers India tremendous opportunities for export. During 2016-17, India exported fruits and vegetables worth Rs. 10,369.96 crores/ 1,552.26 USD Millions which comprised of fruits worth Rs. 4,448.08 crores/ 667.51 USD Millions and vegetables worth Rs. 5,921.88 crores/ 884.75 USD Millions. Also, for the first time this year, the value of milk produced exceeded the total value of foodgrains, making it India's most valuable crop! 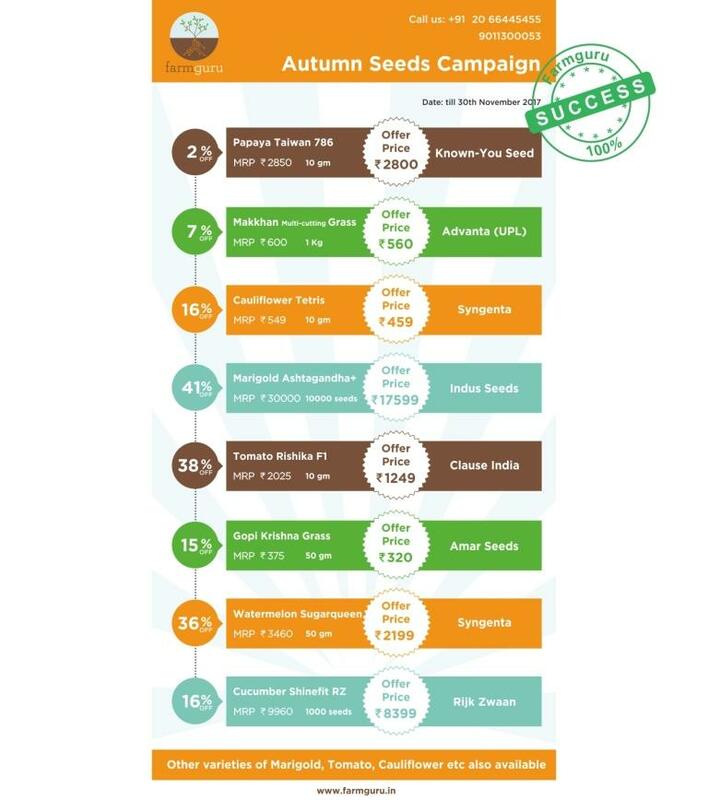 In this autumn seasonal campaign, Farmguru has included 2 multi cutting grass seed varieties specially for dairy farmers. The grass grows about 7 ft in height and is tender for chewing and is nutrition rich. We have also included our best selling seasonal varieties of papaya, watermelon, and marigold. On growing demand from customers for poly-house varieties, we have included Shinefit cucumber seeds from Rijk Zwaan. Get upto 38% bumper discount on MRP when you pledge an order with Farmguru ! Get upto 30% bumper discount on MRP when you pledge an order with Farmguru ! This 'Dhanlaxmi' Campaign, Farmguru has brought for its farmers a good mix of Herbicides, Fungicides, an Insecticide and a Plant Growth Regulator for an integrated crop protection approach. These time-tested products are farmer-approved and highly effective. Weeds grow in the fields and compete with crops for water, soil nutrients, light and space, thus reducing crop yields. This is why we have included two very popular weedicides in this campaign. We wish our farmer friends a very Happy and Prosperous Diwali with maximum crop yield! Navratra Special Campaign brings A-1 quality fungicides, insecticides and a Plant Growth Regulator as part of its basket offer for its farmers. Farmguru uses expert opinion to create an ideal product basket which provide overall protection for your crop. After the recent success of July Monsoon Campaign, Farmguru is back with an IPM Campaign for disease and pest control in Crops. Independence Campaign has brought a basket of 5 broad-spectrum crop protection products which promote plant growth and attack insects systemically. These specially curated products will help our farmers reduce the gap between actual and farm yield. India is the largest producer of pomegranates in the world. Farm Input Purchase is one of the key requirements to ensure a good pomegranate fruit yield . FarmGuru offers to its farmers the list of Top Quality Crop Protection products! FarmGuru's Large group of over 10,000 farmers together can procure these at the best prices!